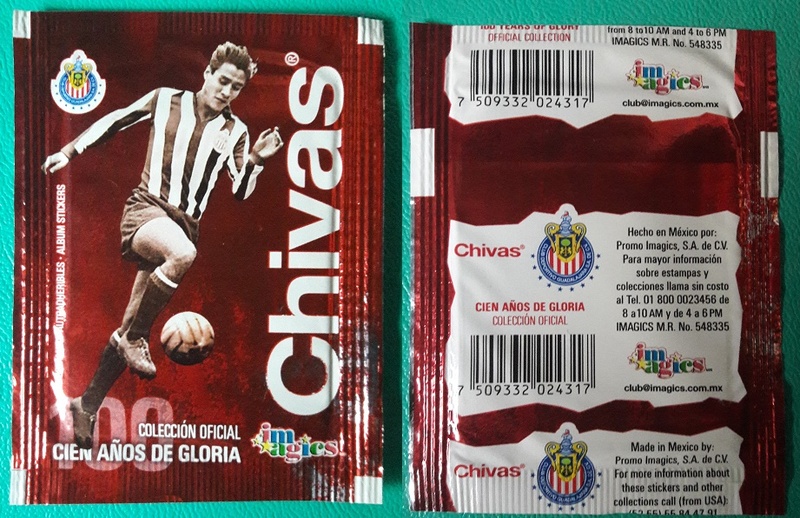 In 2006, the glorious Mexican football club Chivas from Guadalajara celebrated its first 100 years. For this occasion, a local producer (Imagics) published a football sticker album celebrating the history of the club, the trophies obtained and the team selection for the season 2006, with a total of 200 stickers. The album cover shows a large number "100" with the red-white colors of the club. In the following, each section of the album is described. The album begins with an introductory page including a particular collage of 12 stickers of various moments of the club's history from 1906 to 2006. In 1906 in Guadalajara, a new club is founded by friends from different nationalities: Mexican, Belgian and French. At first, the club was named "Club Union" until 1908, which is when it was changed to "Club Guadalajara". Here we find stickers of the first pioneers, the first players, and the first T-shirt in red and white. The Club Guadalajara became more and more popular through the years, gaining the first victories and trophies. Then, in 1939 the club was invited to join the Mexican Major League. The most glorious age of Club Guadalajara was from the season 1956-57 to 1969-70, during which it won the total of 8 League titles and several other National and International trophies. This section includes all of the heroes and legends of the period of "El Campeonisimo" from 1956 to 1969. The golden age of Chivas was followed by 17 years without any title. In 1987, finally the day came that Chivas won its title number 9 after defeating Cruz Azul 3-0 in front of 75 000 supporters at the stadium Jalisco. This section includes the stickers of these legendary players. In 1997, Chivas obtained his title number 10. In the final, Chivas first equalized 1-1 in the stadium of Toros Neza and then won with a large 6-1 in front of its supporters. Gustavo Napoles and Ramon Ramirez were the symbols of this success. A major change occurred in 2003, when the manager Jorge Vergara Madrigal bought the Club Guadalajara, thus becoming the new president. He promised to build a new stadium marking the beginning of a new era for the club. Stickers of 27 players and the Dutch coach Hans Westerhof for the season 2005/2006 are part of this section. Three stickers in action for each player are included in the following pages. Second last section of the album is about the new stadium of Chivas that was planned for 2006, but was finally inaugurated in 2010. It holds more than 45 000 people. In this section there are stickers of the drawings of this project. Chivas is the club loved by the people. The last two pages of the album are dedicated to the supporters of this club that is popular everywhere in Mexico. In addition to the sticker collection, there are also 50 commemorative medals. They are round cards representing the best players of the club during the first 100 years of its existence.